Print vibrant and detailed documents with this Brother MFC-L3750CDW Color LED All-in-One Printer & TN227BK High-Yield Black Toner Cartridge Kit from B&H. The high-yield toner cartridge is rated for up to 3,000 pages. 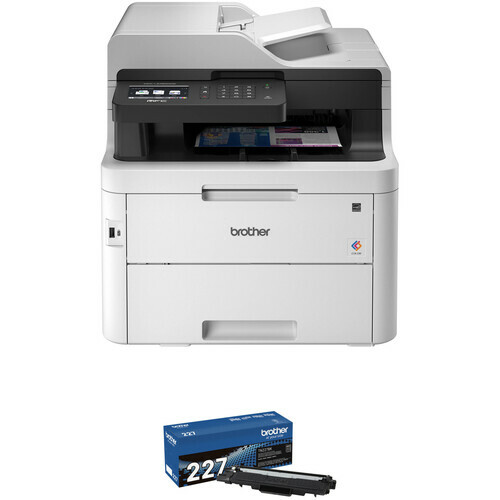 With high print speeds, a large paper capacity, and fax, copy, and scan capabilities, this MFC-L3750CDW Compact LED Color All-in-One Printer from Brother works great in a home or small office. Copy and print speeds can reach 25 ppm in both black and white and color thanks to a 50-page automatic document feeder. Duplex printing utilizes both sides of a sheet and helps you save on paper. A relatively compact size ensures the printer won't be too obtrusive in a room. Also, built-in Wi-Fi connectivity enables printing from a mobile device via Apple AirPrint, Google Cloud Print, Mopria, and other services. Printer controls and settings are viewed via the 3.7" LCD touchscreen. Print paper up to 8.5 x 14" at 600 x 2400 dpi in black and white or color. Single-sheet manual feed slot accepts paper from 3 x 4.57" to 8.5 x 14". 25 ppm printing speeds keep up with your workflow. Mobile printing via Wi-Fi is possible with Apple AirPrint, Google Cloud Print, Mopria, Brother iPrint&Scan, and Wi-Fi Direct. Scan with either the 8.5 x 11.7" color flatbed or ADF. Maximum interpolated scan resolution is 19200 dpi. Direct scanning to select destinations like email and FTB is also possible. Copy up to 25 ppm in black and white or color. Maximum copy resolution is 600 x 600. Copy modes include: sorting, N-in-1, multi-copying (up to 99), and ID copy. Fax modem speed is 33.6 kb/s with the ability to store up to 500 pages. The printer also holds 200 speed dial locations. This black TN227BK High-Yield Toner Cartridge from Brother works with other toner cartridges to output vibrant and detailed documents on select Brother printers. It is rated for 3000 pages. Box Dimensions (LxWxH) 23.0 x 22.0 x 21.0"
Box Dimensions (LxWxH) 15.8 x 6.8 x 4.4"
IF one of the non-black toner cartridges is empty can this printer still print using black toner? Is there a glass plate for single copy function, or only the document feeder? Thanks. Yes, there is a glass plate for single copier functions.